The man who did what and then what? Robert D. Krzykowski’s first feature isn’t a throwaway joke, but an elegantly crafted and designed fantasy grounded in human values. Sam Elliott’s crusty sixty-something secret agent comes out of retirement to save the world again — will the slaying of another bizarre horror lay to rest disturbing memories of a secret WW2 mission? This thing will be a pleasant discovery for those in pursuit of ‘something completely different.’ The intentionally awkward title is jarring, but it fits because I’ve never seen anything quite like this before. Starring: Sam Elliott, Aidan Turner, Ron Livingston, Sean Bridgers, Caitlin FitzGerald, Larry Miller, Rizwan Manji, Mark Steger, Nikolai Tsankov. Remember the old advertisements about Smuckers Preserves? With the name The Man Who Killed Hitler and then The Bigfoot it has to be good! Both John Sayles and Douglas Trumbull became interested in the eccentric screenplay written by Robert D. Krzykowski, especially after seeing his graphic novel- stylized short subject Elsie Hooper. Although neither Sayles nor Trumbull is a Hollywood power player, the endorsement of the brilliant Sayles should raise a flag with any discerning filmgoer. Hitler/Bigfoot’s sub-title should read, ‘What must a movie do to attract attention these days?’ We might expect a mash-up of monsters and pulp Nazi thrills, which sounds un-promising and potentially tasteless: ‘Himmler versus the Werewolf.’ But Krzykowski goes in a completely unexpected direction, with an absorbing personal story that takes itself entirely seriously. In other words, it’s a real movie that resists preconceived assumptions. The title might be awkward, but it’s better than ‘The Man Who Saved the World, Twice,’ or something arty or obscure. The picture is a bit on the arty side, but I’d argue, in a good way. It’s a risky mix, and not likely to thrill the legions of brain-dead Marvel/DC fans that insist on seeing their favorite old story told yet again. These days, any literal, thoughtful narrative runs the risk of boring audiences with short attention spans. Krzykowski has the enthusiastic participation of actor Sam Elliott, who was just nominated for a supporting Oscar in A Star is Born. Hitler/Bigfoot may end up being known as the ‘other’ movie made by Sam Elliott in 2018, but its uniqueness guarantees that it will build a following. There should be no spoilers in this next paragraph, although Hitler/Bigfoot will best be experienced cold. The adult life of Calvin Barr is told in alternating scenes taking place in the present (the 1980s) and during World War II. A language expert, Calvin leaves home for secret duty without getting the chance to propose to his sweetheart Maxine (Caitlin FitzGerald). He succeeds in his secret mission, yet forty years later feels nothing but regret, for a lost love as well as the disillusioning reality that his outrageous (but still top secret) exploits did little to change the course of the war. Now in his sixties, Calvin feels useless and alone, even though he has a firm friend in his younger brother Ed (Larry Miller). Then a pair of government agents (Ron Livingston, Rizwan Manji) contact Calvin. It turns out that only he can essentially save the world a second time. It’s a completely different kind of secret mission, one that Calvin views as a potential path to atonement. That’s a pretty vague synopsis for a film crawling with screwy content: Nazis, superstitious Russian partisans, a potentially apocalyptic pandemic and a legendary monster. Yet it’s all grounded in the dour but mellow character played by Sam Elliott, who sets aside the winking joker personality that was so winning in The Big Lebowski. Yes, the pulp elements are fully in place. The youthful Calvin is an aw-shucks small town guy who can’t spring the question on his lady love… yet he’s also a language expert and an OSS agent so slick that he can penetrate Nazi security all the way to Der Führer’s forest chalet hideout. An early action scene tells us that the senior-citizen Calvin is still a mean hand-to-hand fighter. Yet none of this strains the film’s believability. Krzykowski’s visual instincts are excellent; his shot choices sketch an impressive Canadian forest trek without boring us once. His compositions are artful, but not in a forced graphic-novel sense; his storyboards (included on the disc) have the feel of a quality illustrator, not a sketch artist’s scribblings. But the film’s best trait is its sense of narrative discovery. We have ABSOLUTELY NO IDEA where the story is going at any individual moment. Krzykowski doles out information about Calvin piecemeal, forcing us to pay attention. Fractured time-structure storytelling has become a cliché to add false interest to what are often dull, straightforward stories, but here the flashbacks have a purpose — everything we see is framed as one of Calvin’s plaintive memories: did he do the right thing? Although much of the movie is technically an action adventure, it’s not about wham-bam combat scenes. Krzykowski instead emphasizes character details that might be clues: a toy dinosaur that reminds of the origami unicorn in Blade Runner, the pebble that Calvin feels in his shoes but can never find. Calvin learns that The Bigfoot is as intelligent as the creatures in Val Guest’s The Abominable Snowman… at one point, the expert tracker picks up some mush from the trail, and realizes that it’s a poultice that The Bigfoot has applied to a wound. Director Krzykowski must be a firm believer in cinematic mysteries, as he leaves a quizzical loose end or two to ponder. The main one is an old wooden box that Calvin retrieves at intervals to contemplate in silence. But he does not open it. Only one scene exploits a Quentin Tarantino-like situation. Calvin consents to letting a none-too trustworthy Russian partisan (Nikolai Tsankov) shave him with a straight razor, as part of a semi-superstitious ritual. The picture wisely builds itself around the audience appeal of star Sam Elliott. He’s so engagingly pleasant that we wouldn’t mind seeing a movie about nothing but Elliot strolling through town, just greeting people. A sequence concerning a lost & found lottery ticket defines Calvin’s character in terms of values no longer in vogue. He’s neither melancholy nor bitter, but a nice riposte to the ‘get off my lawn’ sentiments expressed in some of Clint Eastwood’s movies. Calvin Barr’s first mission reminds of (but owes little to) Fritz Lang’s Man Hunt, and his acceptance of aging clues into Sam Peckinpah’s Ride the High Country. The show has almost nothing in common with Quentin Tarantino’s Inglourious Basterds. The young leads are outstanding. Aidan Turner (of the Hobbit movies) has eyebrows just expressive enough to suggest the future shaggy brows of Sam Elliott. Aidan has a winning Jimmy Stewart quality when wooing his home town girl, and a proper stoic intensity when impersonating an SS envoy, in the somewhat sketchy Nazi mission sequences. Fifth-billed Caitlin Fitzgerald brings romance into the story, as the young teacher that Calvin loves so much. Krzykowski idealizes Maxine without making her the expected male fantasy of the One that Got Away — she ultimately has her own agenda. The show properly uses Sam Elliott’s star appeal: we care very much for Calvin’s happiness, and Maxine is a beacon of positive hope. Krzykowski orchestrates the rest of the characters along more predictable lines — all are earnest, earthy and credible. The agents that recruit the elderly Calvin are not cynical bureaucrats, and the neighbors in Calvin’s New England home town are sincere and supportive. The script doesn’t try to make EVERYTHING that happens support the central theme. The Russian partisan’s ‘curse of good and bad luck’ doesn’t make Calvin more superstitious. The child’s school play we see is not leveraged to reflect directly on the potential devastation of a pandemic, not like the too on-the-nose ‘Pied Piper of Hamelin’ play in the tragic, touching Testament. If there’s anything slightly ‘off’ about Hitler/Bigfoot, it’s that the wrap-up epilogue scenes drag on a tiny bit too long, without reaching a full closure. Can nobody acknowledge original screencraft? The discouragingly tepid reviews I’ve read for The Man Who Killed Hitler and then The Bigfoot miss the boat entirely. More than one reviewer takes the show to task for not living up to the expected Battle Royale they think is demanded by its ‘pulpy’ title. What did they want, ‘The Stranger versus Predator?’ Other notices conclude Krzyskowski is trying to emulate Tarantino. Still another reviewer imposes his personal political agenda, dismissing the show as tasteless for failing to confront the Holocaust. I guess that’s what happens when a movie doesn’t fall into a convenient category. Think “It’s a Wonderful Life,” except George Bailey’s secret past and disappointing life hasn’t been so wonderful. I like the reflective pace of Hitler/Bigfoot and I think it has a lot to say about heroism stories past and present. It posits an interesting attitude to hero stories. Calvin Barr’s first mission had little effect on the outcome of the war; it was a successful failure that left him empty-handed, and with a failed personal life as well. I think Calvin Barr has a lot in common with the surviving Dutch fighter depicted in Paul Verhoeven’s Soldier of Orange: what was it all for? Unlike the war heroism ‘marketed’ on today’s news shows, the public aspect of heroism means nothing to Calvin; he hates killing, has no desire to talk about the unpleasant things he did, and he cherishes his anonymity. Perhaps Krzykowski has fashioned a fantasy ode to Calvin Barr’s entire generation of men, many of whom felt they had little choice but to set their lives aside for what was an all-important struggle to ‘save the world.’ I understand that his new adventure is a fantasy ‘second chance’ to Do the Right Thing. Can an old warrior find peace by taking up his weapons once again? Any show that attempts to integrate such seemingly incompatible pulp themes must be seen as a daring narrative experiment. Krzykowski announces that intention with the vertical line amended to his main title graphic. Remember what Luis Buñuel wrote in his review of Fritz Lang’s classic Metropolis? Buñuel described Metropolis as two different stories glued together by their bellies. The Man Who Killed Hitler and then The Bigfoot pushes that construction even further. That’s a read of a movie that works much better when it’s simply experienced. The way Robert Krzykowski assembles his unlikely-sounding genre mash-up, it all makes perfect emotional sense. Better yet, Sam Elliott’s hero is a genuine three-dimensional hero of the Old School. We love that guy. RLJE Films’ Blu-ray of The Man Who Killed Hitler and then The Bigfoot comes from an unfamiliar home video outlet, but its quality matches any disc in the business. I don’t know if the show was shot on film or video, but it has a handsome, dark look. Robert D. Krzykowski favors very wide screen images, and he uses his broad canvas well. Calvin’s town has a picturesque downtown, and his romantic stroll with Maxine gives us interesting midnight views of a river walk. The extras include some choice items: a gallery of Krzykowski’s concept art, a few minutes of good deleted scenes, and the director’s surprising short subject Elsie Hooper, a mostly live action show that uses a puppet for its stylized main character. It is insubstantial, yet it sells us on the director’s potential, much as does the amateur work of Guillermo Del Toro. I heard about the show a year ago from the former Trumbull associates that reunited to work on its impressive visual effects, the resourceful effects supervisor Richard Yuricich and matte artist and animator Rocco Gioffre. The movie recreates an acceptable WWII Germany with just a handful of selected shots. From the making-of show we can see that the German warplanes were filmed in a cloud tank. A single fake boxcar door was transformed into an entire idle train, waiting to provide an escape for Calvin Barr’s unerring ‘rogue male.’. I assume that some of those shots are Rocco’s amazing matte art work; I’ve long since stopped trying to guess what’s real and what’s not. Rocco did say that the flawless downshot of Calvin climbing a rock cliff is the work of his colleague (and another friend from way back) Mark Sullivan. The résumés of Rocco and Mark overflow with great work in important titles. Sometimes it’s obvious what they contributed, but just as often I’m completely fooled. As it turned out, after forty years behind the camera, Rocco ended up playing a role on screen. The director needed a ‘priggish Nazi’ for an important scene, and wisely intuited that the very un-priggish Rocco would do well. He’s terrific, helping to set the tone in the minimalist Nazi chalet sequence. I write this review knowing I need to see the show again soon… I missed some things along the line and am not certain I fully understand the significance of the final scene. Did I not hear exactly how did Calvin Barr acquire his all-important immunity? 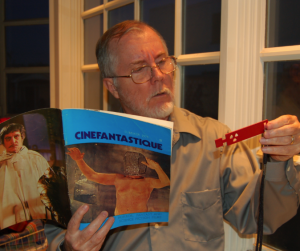 Note: Robert D. Krzykowski is host Josh Olson and Joe Dante’s interview subject on Trailers from Hell’s The Movies that Made Me podcast from last week. It’s an elevated, wide reaching discussion.